This book is about the energy personified by the classical Greek goddess Themis, who brought her divine and natural 'right order' to gods and humans, and who still presides over law courts as the figure of Justice. In many Western countries today, the growing dis-ease in minds and bodies of individuals is often echoed in whole communities. Rather than coming together, they seem to split apart in anger and distress. But themis energy is equally powerful, and can work to bring together and to heal. 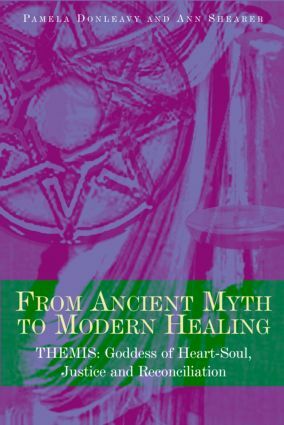 From the battle of the Titans and Olympians to the oracle at Delphi and the banquet of the gods, the stories of the goddess weave through these chapters to illuminate how themis energy is at work today. The authors explore psychological healing in individuals and relate this to new research in neurocardiology on the subtle interactions of body and mind. They show how the international movement for restorative justice is drawing on the same healing tools to benefit victims and offenders alike. And they evoke the extraordinary story of the South African Truth and Reconciliation Commission, which shows the world how themis energy can help transform a ravaged society. This book deepens understanding of the psychological urge towards healing and wholeness which is as much a part of human beings as the urge to destroy. It offers exciting new insights into Jung's unique approach to the relationship between individual and collective psychology. It will appeal to psychologists who work with individuals and groups, to lawyers and others concerned with the failure of current criminal justice systems, and to people involved in religious, political and other groups that seek to build communities which can encompass and even celebrate diversity rather than rejecting it in fear.